Everest Base Camp Tour from Tibet is a very comprehensive tour of Tibet with visits to the cultural, historic and natural attractions of Tibet. The tour includes all the important places of interest in central & south Tibet including a visit to Rongphu Monastery and Mt. Everest Base Camp. After flying in to Lhasa from Kathmandu, Chengdu or Beijing, explore the cultural and historic sites of Lhasa, Shigatse and Gyantse. Afterwards drive overland, in 4-WD jeeps, across the Tibetan highlands and high passes to the fabled Rongphu Monastery and Mt. 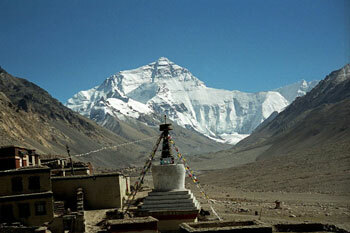 Everest Base Camp from where the view of the great North face of Mount Everest is the most spectacular of all. From Ronbhuk drive across along the Kerung Highway through the Himalayas to Kathmandu, Nepal. Day 05: Drive To Xegar Via Sakya Monastery. Day 07: Excursion around Everest Region and same day drive to Tingri. Day 08: Drive To Kerung. Your tour ends at Sera Monastery, where you will get the chance to experience “Buddhism Scriptures Debating”. These debates are unique to Sera and are quite famous. Enjoy the debatesDay 04: Drive To Gyantse via Yamdrok Lake. Everest Base Camp Excursion (5030m) A 2 Hrs. Trek from the Rongbuk Monastery Will Lead You the Base of the Highest Peak on Earth - The North Face or Mount Everest (8848m) or Mount Quomolangma in Tibetan. Explore the Base Camp and The Later In the Afternoon to Tingri. O/N at Guest House. You will cross two high passes Lablung La ( 5, 124m) and Tong La ( 5, 120m) and have the last views of Mount Everest, Sishapangma and Cho Oyu. Then the road drops to Kerung. At the Kerung Boarder, see off Tibetan Guide and driver and continue to Kathmandu with the Nepali counterpart. We stay in a deluxe hotel in Kathmandu that we deserve after traveling in rugged Tibetan terrain with limited facilities.